Kingdee EAS is integrated with the social network “Cloud Home” seamlessly to build an enterprise social workspace so that you can easily realize real-time communication and interaction of business. Process-based communication: ERP business information anytime@business handler, implementing timely communication. Group collaboration: ERP business information is quickly shared among business groups to realize efficient collaboration. Short email alarm: Key ERP information is sent via short emails automatically to remind users, realizing smart alarm. 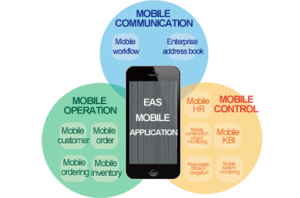 Kingdee EAS combines ERP with mobile technologies to process ERP business anytime and anywhere through terminals such as smartphones and tablet PCs, enable corporate managers and employees to break through restrictions of time and space, and implement efficient and accurate communication, timely business processing, and agile decision-making control. 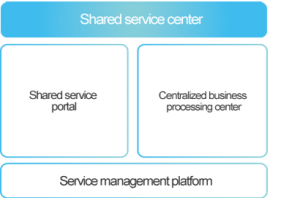 Targeting at the management trend from decentralization to centralization and sharing, Kingdee EAS V7.5 provides applications such as centralized business processing center and sharing service portal to realize centralized processing and self-service sharing of finance, HR and other businesses. You can easily batch handle businesses and improve the group enterprise management and control level. 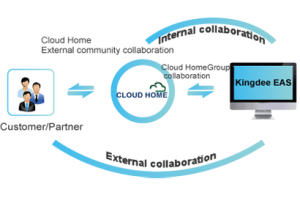 Kingdee EAS V7.5 is closely integrated with the EAS role portal through Kingdee KBI. 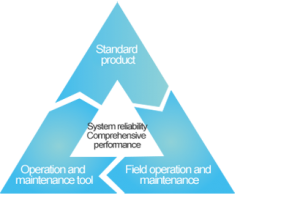 Various analysis models are preset so that you can easily perform configuration according to personalized requirements of the enterprise, quickly probe into conditions such as finance and HR of the group and subordinate companies, and support efficient decision-making of the enterprise. 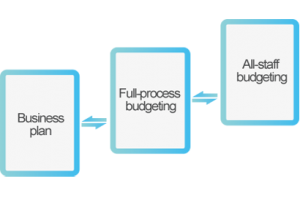 Based on the comprehensive budget concept, Kingdee EAS V7.5 centers on strengthening all-staff budgeting and full-process budget management, provides a Web budget management platform, and reinforces all-staff budget collaboration. It implements the closed management loop of “strategy-business plan-budget management-execution” in the enterprise through comprehensive integration with the business plan and rolling budget. 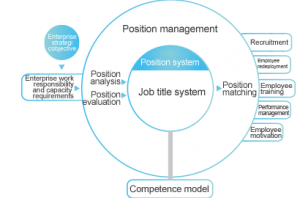 By reconstructing the position system, Kingdee EAS enables the enterprise to combine strategic objectives, clearly know work responsibilities, ability requirements and work value evaluation, design the HR policy, personnel, payroll, performance, recruitment and training based on the job title system, and clarify the personnel composition and its matched manpower management system. 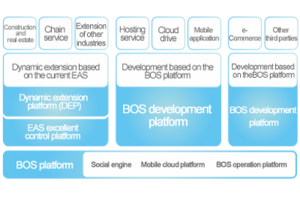 Kingdee EAS V7.5 adopts the cloud computing technology, network acceleration technology, and memory cache technology and greatly improves the system performance and stability and guarantees large-scale and highly reliable applications of group enterprises through the cloud computing platform, KingPower application accelerator, EAS operation and maintenance platform, and deep optimization for key businesses. Kingdee EAS V7.5 provides all-round extension platforms such as the DEP dynamic extension platform, BOS development platform, and integration platform so that you can implement simple and fast customization, completely personalized development and heterogeneous system integration and support customization as required and comprehensive integration of the enterprise. Similar to WeChat of enterprise edition, Xuntong makes full use of mobility of mobile terminals to provide query for employee information anytime and anywhere for all staff of the enterprise and can quickly implement exchange of point-to-point or multi-person text, voice and picture information. It obtains the enterprise organization and employee information in real time and supports query and obtaining inter-organization and inter-department employee information, real-time call, text message and mail communication and sharing of employees’ geographical positions. It performs approval, decision-making and transfer of to-do flows and supports viewing of process documents, approval comments and attachments, and tracking and query of being-handled/finished flows. It provides the full-process tracking function for mobile orders so as to timely find problems and quickly respond to and solve problems. It supports reports such as reports of sales business analysis, transaction amount trend analysis and accumulated transaction tend analysis by commodity or customer and enables users to quickly and visually learn the sales status. It provides a convenient online ordering function and tracks the business flow and logistics progress of orders in the whole process, enabling distributors to place orders as needed anytime and anywhere. It enables the sales personnel to grasp inventory information anytime and anywhere, effectively seize business opportunities, and increase the order winning efficiency. 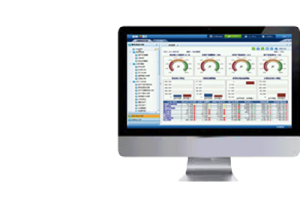 Users can query the information such as inventory balance, inventory location distribution, inventory personnel information, my concerns and historical information in real time. It can monitor the EAS system operation reliability for 7×24 hours, as well as the overall EAS operation environment such as the operating system, middleware, database and EAS application, send alarms about potential problems in multiple modes, and notify the related operators to solve problems. Used by 1,000,000 businesses globally since 1993, including Singapore, Malaysia, Taiwan, Hong Kong and China. Fill in the enquiry form below for an obligation-free consultation.